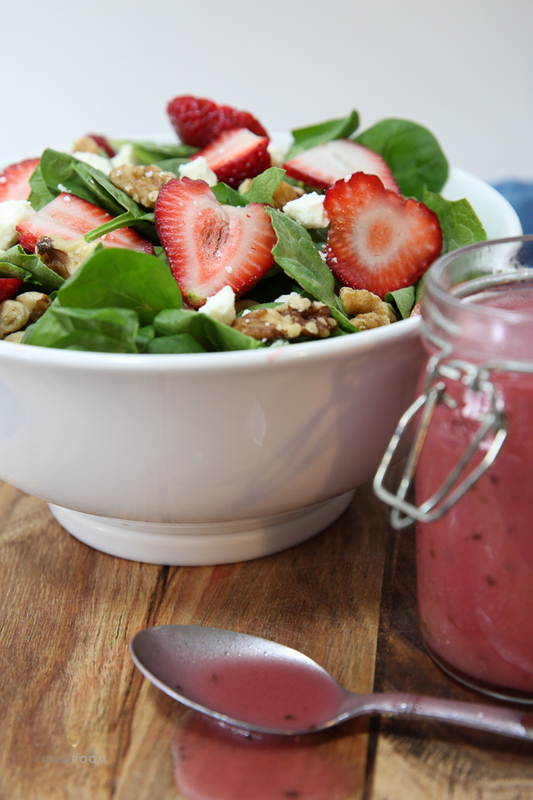 Summer is right around the corner and a fresh salad is perfect for those hot summer days. No one wants to be baking dinner in a hot kitchen in the middle of the summer. 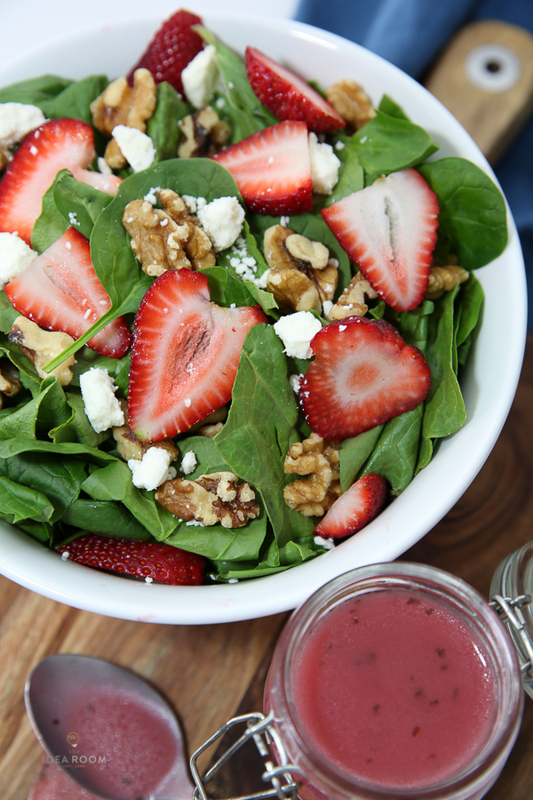 This Strawberry Spinach Salad is the perfect solution. You can make it for a quick and easy lunch or dinner. You can throw some grilled chicken on the salad to add some protein to it for a more substantial meal. 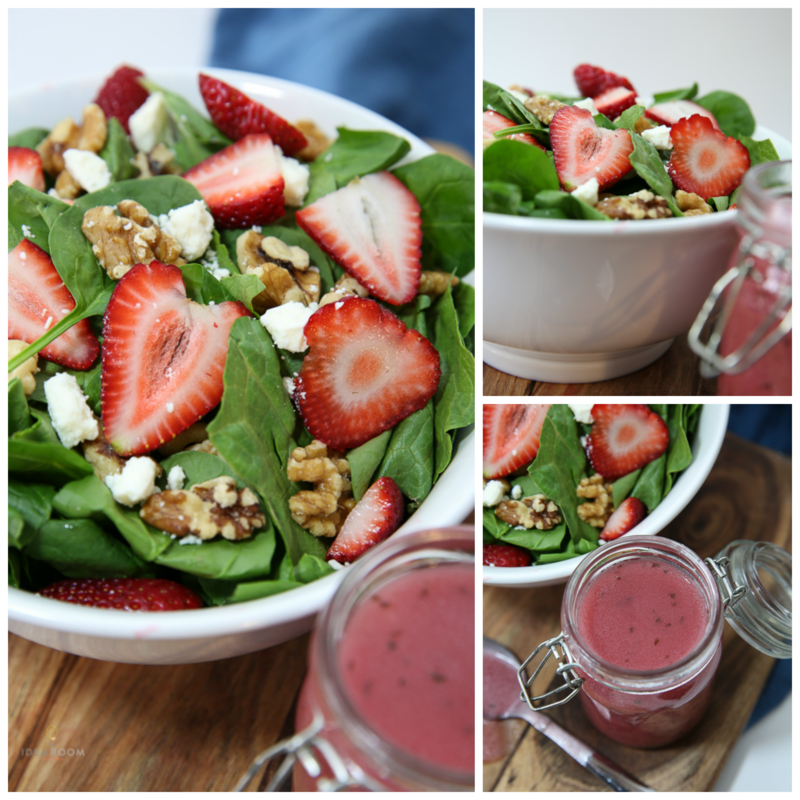 I am also sharing the recipe for this amazing Strawberry Balsamic Vinaigrette Salad Dressing. 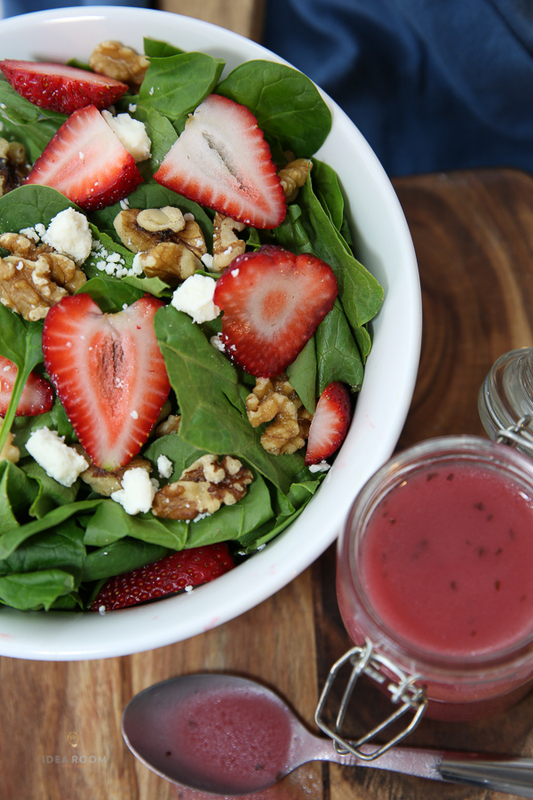 In a large bowl mix baby greens, grilled chicken, strawberries and blueberries. Top with pecans and feta cheese crumbles. 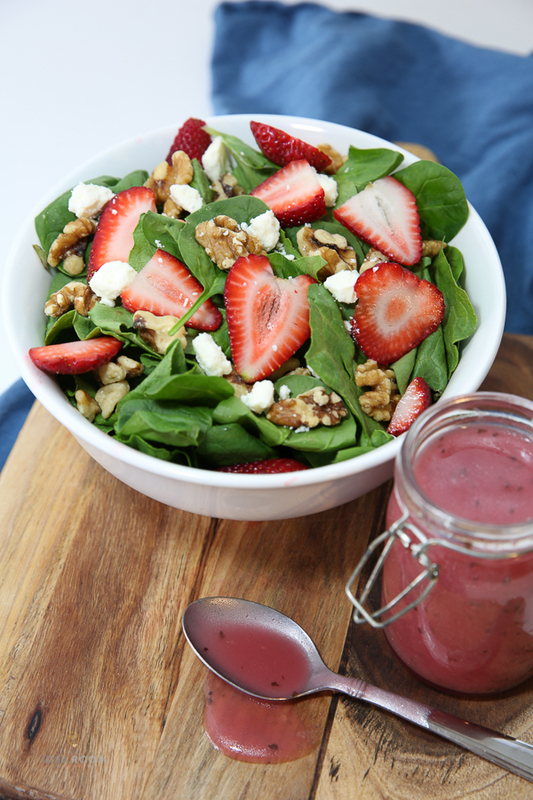 Toss with Strawberry Balsamic Dressing. This dinner can be whipped up in just a few minutes and would make a great dinner for your girlfriends at your next book club, shower or get together. You can always substitute this recipe and add your favorite add ins. Just use what you have on hand for the salad if you don’t have all the ingredients that I have listed here. 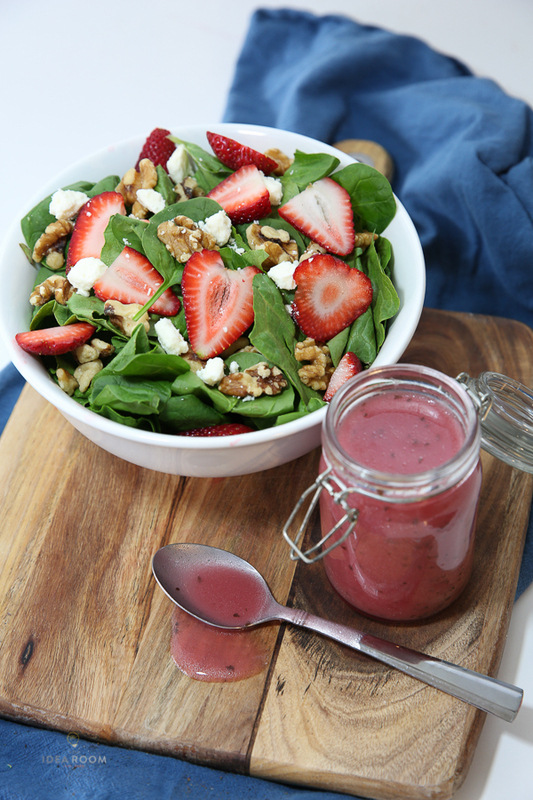 In a food processor or blender, mix together honey, balsamic vinegar, olive oil, apple cider vinegar and the strawberries. Share it with your family and friends! Yum, yum, yum! One of my favorite salads. It really is so tasty! Mine too! It is so yummy! OMG! I LOVE fruity salads. 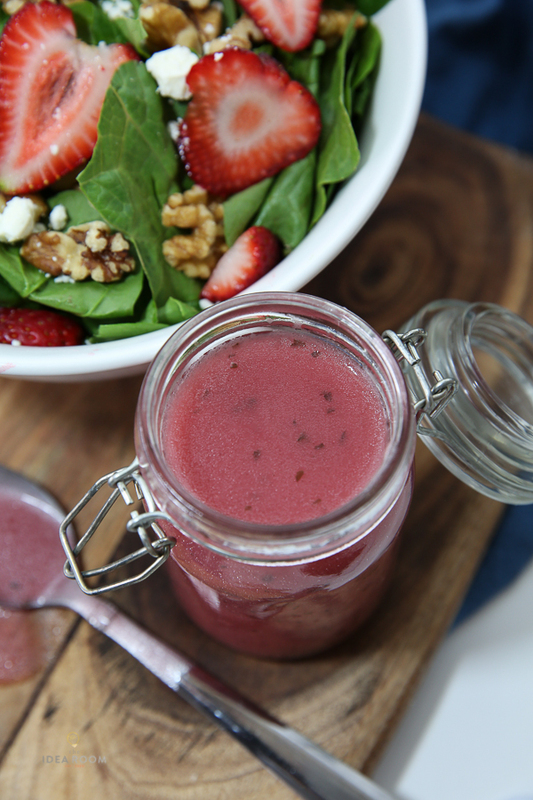 I am totally trying this dressing recipe this summer! Thanks for sharing. It is really yummy! Hope you enjoy it! Thanks. This dressing is so fresh and light. We loved it! Michelle, So happy you enjoyed it! Yum! This is my favorite salad and I’ve been looked everywhere for a recipe for the vinaigrette! Thank you! How much roughly did this make and how long do you think it would keep? I’m wanting to make a larger batch and keep it for easy access…. so you think it would keep? It makes about a cup and a half. It should last about a month. Thanks and Enjoy! I made this a month ago and it was fantastic! Since then, I have tried buying salad vinegrettes that sounded similar and they all don’t come close to this! I just love this dressing! I will definitely be making this again soon. Instead of buying store bought, trying to compare! Thank you so much for the recipe. Emilie- So glad you have loved it! Thanks for your kind words. Delicious! Should this dressing be refrigerated (if made a few hours before serving? Mary- I like to refrigerate mine. I hope you enjoy it! Hayley- I like to serve right away and store in refrigerator and use before the end of the week. Enjoy!